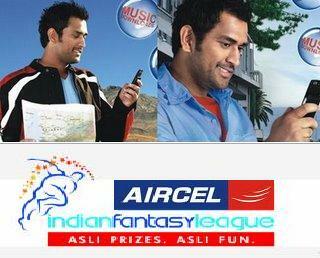 After the launch of Virgin Mobile’s Indian Hatke League another telecom service provider Aircel launched the same as Indian Fantasy League(IFL) in association with TIMES group’s. It is a Fantasy Online Circket game conducting along with IPL matches any one can select players for his/her team and win prizes. Whenever your selected players play well in real IPL, your fantasy team get points. It is completely free and fun. The registration of teams starts from Apr 18, 2009 To May 24, 2009. The online game will provide initial credits to buy 16 players to users when he join IFC. For example If you get 1000 points as your initial credit, you can buy some expensive players like Virender Sehwag (Cost: 130.00) and some low cost players (Sunil Joshi cost:5). From these players you can choose your playing XI players. Your fantasy players get points when the actual IPL match begins. There are points for all the department of playing such as batting,fielding and bowling. The company is offering Maruti Car, YAMAHA FZ motorcycles, Plazma TV,Leptop, and Mobile handsets as prizes to the winners of the IFL game.